A team of researchers affiliated with institutions in the U.S., the U.K. and Tanzania has found evidence that suggests personality traits in chimpanzees are relatively stable over long periods of time. In their paper published in the journal Scientific Data, the group describes the history of the testing, the types of tests given and what they revealed. Jane Goodall is among the most famous researchers in the world today, still nearly a half-century after her groundbreaking work studying chimpanzees in their natural environment in Gombe National Park, Tanzania. Back then, many have noted, the consensus among scientists was that personality traits in animals were invented by amateurs succumbing to anthropomorphism. Goodall was one of the first to suggest very strongly that this was not the case and that animals, particularly chimpanzees, had unique personalities every bit as real as humans. To offer proof, she and her colleagues took and administered tests to one another that served to classify the personality traits they found in the chimps they were studying. Each of the researchers was asked to rate each of the chimps under observation regarding their personalities for such things as how aggressive or trustful they found them. Since that time, a lot of research has been conducted regarding animal personalities and the consensus has changed—now, it is believed that most animals have unique personalities. 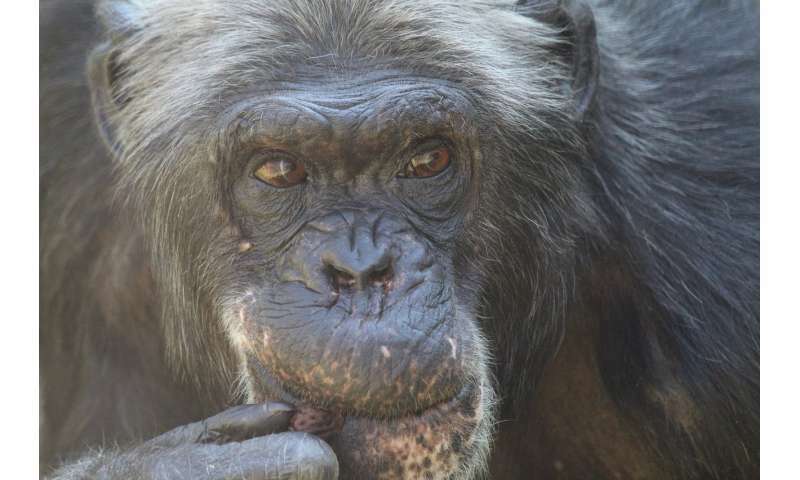 In this new effort, the researchers have revisited the histories of the same chimps that were tested in the 1970s and have tested other chimps to learn more about the stability of personality traits as the chimps live their lives over many years. The researchers used different tests, but note the categories in the new tests could be correlated with traits on the original tests. To learn about trait stability in the original chimps (most of which have died), the researchers asked people who had studied them over the years to take the tests. In addition, they also asked other workers studying other wild chimps to take the tests at different points in time. The researchers then compared the personality scores for all of the chimps across multiple time periods. They report that they found remarkable consistency. While there were some caveats and some minor changes due to accumulation of wisdom as the chimps aged, their basic personalities, like those of humans, remained intact. Researchers increasingly view animal personality traits as products of natural selection. We present data that describe the personalities of 128 eastern chimpanzees (Pan troglodytes schweinfurthii) currently living in or who lived their lives in the Kasekela and Mitumba communities of Gombe National Park, Tanzania. We obtained ratings on 24 items from an established, reliable, well-validated questionnaire used to study personality in captive chimpanzee populations. Ratings were made by former and present Tanzanian field assistants who followed individual chimpanzees for years and collected detailed behavioral observations. Interrater reliabilities across items ranged from acceptable to good, but the personality dimensions they formed were not as interpretable as those from captive samples. However, the personality dimensions corresponded to ratings of 24 Kasekela chimpanzees on a different questionnaire in 1973 that assessed some similar traits. These correlations established the repeatability and construct validity of the present ratings, indicating that the present data can facilitate historical and prospective studies that will lead to better understanding of the evolution of personality in chimpanzees and other primates.